May 7, 2017: For information about the current recall of some Best Feline Friends (BFF) formulas in Australia, click here. If you’ve read this blog for any length of time, you know that I’m passionate about species-appropriate nutrition for cats. Cats are obligate carnivores, and they need meat not only to survive, but to thrive. The optimal diet for a cat is a properly formulated raw, home-cooked or grain-free canned diet. Cats shouldn’t eat dry food; even the grain-free dry varieties are too high in carbohydrates. You can find many of the articles I’ve written about this topic in the Feline Nutrition section right here on this site. I also provide one-on-one consultations if you need help with transitioning your cat to a healthier diet. Protein is listed as the first ingredient on the label, and the meat/poultry used is fit for human consumption. If the meat is organic, that’s even better. The food is grain-free (no rice, barley, or any other grains. Even though these are considered healthy in human nutrition, cats’ digestive tracts are not designed to digest the unnecessary carbs). The food does not contain by-products, corn, soy, or any other fillers. I am often asked what brands I recommend, and you can find a small list of recommended brands in my post The Best Food For Your Cat: My Recommendations. The brands listed are foods I have thoroughly researched, and feed to Allegra and Ruby. One of the brands I recommend and like is Weruva. Weruva recently sent us a very generous sampling of some of their products. Since I rarely accept food for review, the girls were super excited when I opened the box! The first thing I like about Weruva is that they don’t even make any dry food. I also like that you can actually recognize the ingredients in their canned formulas. I had asked for chicken and turkey flavors only – I limit fish to only an occasional special treat. Their chicken dinners look like the chicken fricassee my mother used to make! According to the company, all of their formulas are produced in a human food facility using many of the ingredients and processes that are used in products made for people. Their base proteins of chicken, beef and fish include only top quality muscle meat, such as white breast chicken, whole tuna loins and select cuts of beef. But as with any cat food, the true test is whether your cats will eat it. “Eating” may not be the right word to use in this context: Allegra and Ruby practically hoover up their Weruva meals. 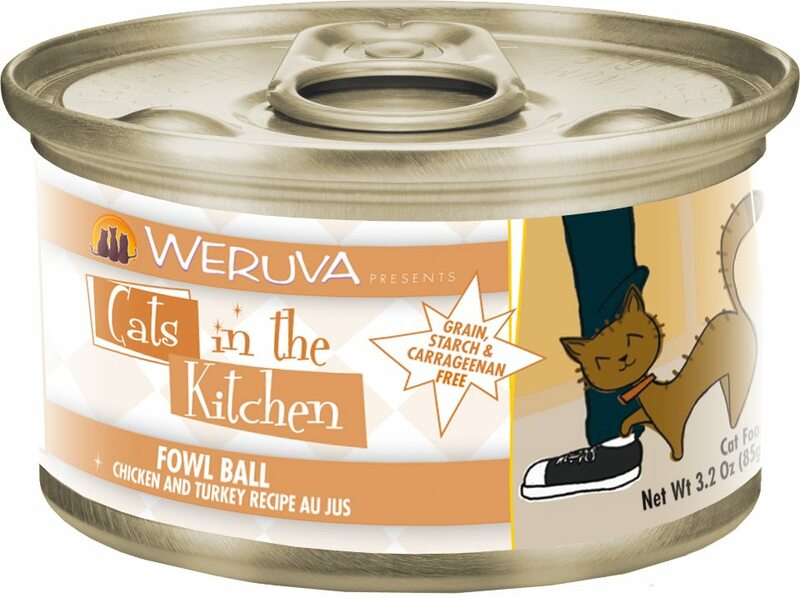 I alternate raw food with canned food, and of all the canned food I feed, Weruva is the paws down favorite, with Fowl Ball being a particular favorite at our house. We got to test the new Cats in the Kitchen Pouches and Canned formulas, and they were all a big hit. I love that they have no vegetables at all in them, it’s all meat. Some of Weruva’s Cat Cuisine formulas do contain small amounts of vegetables and my girls usually just eat around them. These formulas are also slightly higher in carbs, so I prefer to use the all meat ones (and the girls are not complaining!). We also received a can of their new freeze dried chicken treats, which proved to be a big hit as well. There are a few things I don’t like about Weruva, and I discussed my concerns with David Forman, one of the company’s owners. Their diets are made in Thailand. The taurine, and a few of the minerals, are sourced in China. I generally don’t recommend diets with any ingredients sourced in China, but I wanted to understand why Weruva made this choice, given how much I like everything else about their diets. David Forman: “Indeed, country of origin has become a very important issue. What we have always maintained is that it is less about the country of origin and more about the quality control from a particular company and what proactive steps a company takes when they learn there is an issue. Many people are focused on “US only” production and feel it is the safest, but the reality about that is that the US has experienced and continues to experience higher rates of recall than most countries, including those in China.” Given the recent slew of pet food recalls, most of them for dry food, this point is well taken. The diets are lower in calories than many other canned diets. This isn’t so much a concern, as it is something I want you to be aware of – you may have to feed larger amounts to make up for the lower calories, as compared to other brands. However, chances are, your kitties won’t be complaining about that! 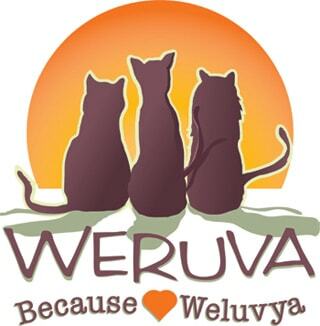 For more information about Weruva and their products, please visit Weruva.com. I received free products from Weruva. Receiving the complimentary products did not influence my review. « RenAvast: A Solution for Chronic Renal Failure in Cats? well the main problem with that is my cat refusing to eat any sort of turkey.